I'm always amazed when a business, any business, says that they are so busy they just can't seem to handle any more business suddenly drops their prices to attract new customers. Did I miss that class in econ 101? 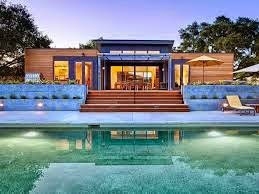 The homes still aren't cheap by any means, but through the manufacturer's economies of scale and a growing interest in prefab building, they are able to start passing those cost savings on to the customer. I know of no other modular home factory in the US that could lower their basic pricing by about a third and stay in business unless they had been overpricing their homes from the beginning. CLICK HERE to read the Inhabitat article. You might call them Bling Homes - Americans will pay for perceived value, and not necessarily quality, that justifies the astronomical price. Anybody actually compare old versus new pricing? I did and most items seem to have actually gone up in price and I could not find anything that went down by $140,000! Read the article. This applies to their 2015 lines. So any $140,000 reduction will apply next year. Good point anon that is why I looked at the 2015 price list on their website and compared it to the 2014 price list I already had.